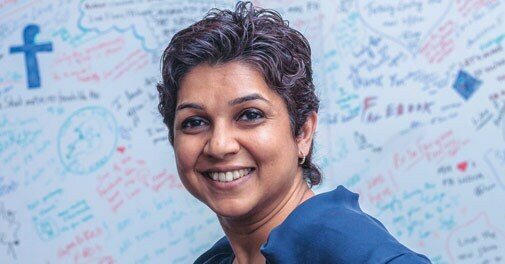 A year ago Kirthiga Reddy, now head of Facebook India, had moved to Mumbai from Hyderabad. She was to head the sales for the company. Reddy talks to Business Today's Sunny Sen on the changes that Facebook is going through. Q. How did you go about adding customers? A. It was about a year ago that the company had asked us to focus on the client and agency partners. Over the last nine to ten months we have approached it in three different ways. First, we built our team. We have doubled our sales and marketing investment and hired strategically. We hired people who have come from television for example from Colors. We have someone from print too because we know that when we talk to a marketer, every dollar they spend is what they could have spent on television, print or digital medium. It is all about understanding the client's business objectives and be able to talk their language. Thinking what their business needs and crafting the right solutions for them is a very important vector for us. We recently hired an agency head who comes from Maxis. Second is talking to our key clients across verticals and the third is building our partners' ecosystem. Q. How did you choose the verticals? A. The three verticals that we focussed on are FMCG, tech and ecommerce. In FMCG, we will give you a case study on P&G or Unilever. In tech, it could be Tata Docomo or Nokia. In ecommerce, we will give you Myntra, Yepme... the list goes on. In other areas, there are clients that are innovating. For instance, ICICI Bank in the financial sector. When we started operations in India in 2010, we had eight million users. Today it is 100 million. When we started our focus was twofold. One was our global operation centre in Hyderabad that serves over a billion users, a million advertisers and hundreds of developers. Second was the focus on user growth and driving the partnerships with mobile operators and device makers. In the first three years, I spent most of my time in global operations. I also spent some time with our key advertisers. Pepsi is our early advertiser and that was our first India case study. We did the World Cup India cricket match and they found that they were able to achieve 60 per cent share of voice using the Facebook platform. These days it is clients who are helping us take our solution forward. P&G, for example, wanted to release Gillette Vector 3 for tier II and III cities. They asked for us and wanted to use our feature phones to drive the message. They were the first client in the Asia-Pacific region to pilot our brand measurement on feature phones. Now we have a market product team in Menlo Park with dedicated engineering resources. They are rolling out a steady stream of products based on inputs that they have got from the market. Q. Has your interactions changed with your clients? Q.Wasn't Komli an external agency? A. Komli was a reseller partner. We have evolved our relationship with them. They are our FBX partner, which is our remarketing solution. If you go to Makemytrip and look at a trip to Goa, and then if you have to target that set of people on Facebook with our solution, then you need a re-marketing platform and that is what Komli provides. In Mumbai, we are working with the largest advertisers and agencies. The interactions too have evolved. With over a 100 million users, we have a daily reach which is about 45 million. This is over five times larger than the largest English newspaper and four times larger than the highest rated television programme. Clients really look up to you for a reach. Our conversations have changed thanks to user growth. A year ago when I met with Nitin Paranjpe, his biggest ask was education. He said this is a new platform. You have to tell us how to best leverage the platform, what are the best practices across the globe. So since then we have done a bunch of programmes with them. We go and do sessions with all the brand managers and work with their agency partner. We tell them the consumer trend across the globe and success stories in other parts of the world. Naturally the next question was how to measure the brand impact. So we did the first Millward Brown study in India. However, the methodology that existed could not adapt to Facebook. FB does not allow pop-ups and Millward Brown depended either on pop-up or a panel. Panels don't exist in India. We had to craft and design a solution. We also did a Vaseline Lip therapy product relaunch and did this study. It showed 18 per cent increase in purchase intent. We have 97 per cent accuracy in terms of reaching the right gender and age-group. Even six months ago we used to show clients global case studies. But now we give Indian examples. This in itself points to the shift in the last one year. We have also been focusing on building our partner ecosystems. We took one significant step in that area by having a pact with GroupM. This is the largest agreement for FB in India and centres around research and measurement - measuring how their Facebook ads translate into revenue. The fundamental differentiator that Facebook offers is real identity. So we are able to create a controlled group and an exposed group, and both groups see across media platforms. We were able to tell how many people actually shifted to Nokia Lumia device, because they were using Facebook from their mobile. Q. What would be the average return? A. The average globally is anywhere in the range of three to five times. These are global stats. Nokia was the first to use the Facebook Outcome Matching solution. We have a Studio Edge program, that's specifically geared for agencies, to help agencies get to know the best practices on Facebook so that they can help their clients' business get results. Q.How big is digital advertising space? A. The total industry is $6 billion. The total pie is growing at 13 per cent and digital is growing at 30 per cent. Q. Do you think Facebook will be able to match the ad revenue of one of the largest English daily? A. I won't comment on specifically. You can see the trend. In the US for the first time digital has crossed television. The last time it had happened was in the 90s when television became bigger than the radio. And if you look at digital, it is mobile which is driving the acceleration of digital. And that is very significant when you think about what is happening in this country. We have 230 million who are connected to the Internet, but there are still a billion who still need to be connected. Mobile is how people are coming on board. It is very significant for brands and marketers because for the first time they are able to reach that set of consumers in a way they were never able to reach before. When we look at our distribution out of the 100 million, 84 million are on mobile . For us digital and mobile are synonymous. Within that while a lot of people think that we are smartphone metro phenomenon, 66 per cent are on feature phone. Marketers come and say we now have an option through Facebook to reach to consumers in a way which was not possible before with mobile being an everyday phenomena. Mobile is a big part of our ad strategy. About a year ago we introduced ad on news feed. The promise that Facebook has to offer is to make marketing personal again. If you think about our targeting ability… what makes our marketing personal is our ability to target. There starting targeting options in our ad create flow - likes, interests, gender, demographic, feature phone, smartphone. Private banks wanted to target NRI cluster and we were able to build one with zero spillage. And since then that cluster has been used by clients in the travel sector, matrimony services and so on. Then there is a targeting option called customer audience. Here clients can use their CRM system and match it with what people are doing on Facebook. I can't think of one advertiser who is not doing something on Facebook in some form or the other. Flipkart-Amazon battle: Where is the money going?